Every book we read is a journey. Either short or long, difficult or easy, it might challenge our views of the world or confirm them. Any way the journey takes us we leave each book changed in some way, even if we reject its ideas. 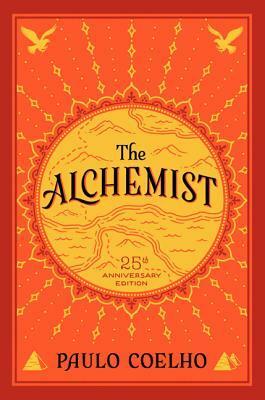 The Alchemist is one of those books that has the potential to speak to people powerfully, because in it we can find our own meaning. There is a simple, untainted truth to Cohelos book. It has the rhythm and repetition of ancient parables, mixed with modern ideas about individualism and the quest for self expression and fulfillment. I was fascinated to read in the intro to my special 25th anniversary edition that Choelo rereads the novel often, for its truth, and its honest expression of himself. Never have I heard of an author rereading their own work, except for public readings or audiobook recordings. To me there has always been a separation between reader and writer, where the former can only hope to guess at the true intent in each word or sentence, and reads their own experience between the lines on the page. But perhaps writers and readers are one and the same, even when it comes to their own work. But I come to reflect on the novel itself I was disappointed by the second half. Perhaps I am not in the right place for this book right now, I didn’t need yet another voice to tell me to follow my heart and seek fulfillment in all that I do, because I am already telling myself that story. And though I enjoyed the ‘ancient parable’ feel, it became a bit tiresome in the second half. I can see why this is a word-of-mouth book. It is one that can so easily be recommended to those in our lives who need an extra boost of confidence to find their own way. Though for me, today, this is a 3.5 star book, one day that may be different when I am a different, future, self.